Micrograph showing an opportunistic infection due to immunosuppression - large (blue) cell below-center-left infected with a polyomavirus. 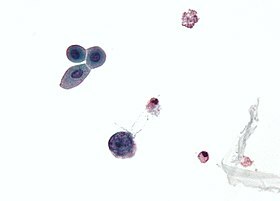 Urine cytology specimen. Administration of immunosuppressive medications or immunosuppressants is the main method of deliberately induced immunosuppression, in optimal circumstances, immunosuppressive drugs are targeted only at any hyperactive component of the immune system People with previous cancer who require immunosuppression are not more likely to have a recurrence, throughout its history, radiation therapy has been used to decrease the strength of the immune system. Dr. Joseph Murray of Brigham and Women's Hospital, was given the Nobel Prize in Physiology or Medicine in 1990 for work on immunosuppression. Immunosuppressive drugs have the potential to cause immunodeficiency, which can cause increased susceptibility to opportunistic infections and decreased cancer immunosurveillance. Immunosuppressants may be prescribed when a normal immune response is undesirable, such as in autoimmune diseases. Steroids were the first immunosuppressant identified, but its side-effects limited its use, the more specific azathioprine was identified in 1960, but it was the discovery of ciclosporin in 1980 (together with azathioprine) that allowed significant expansion of transplantation to less well-matched donor-recipient pairs as well as broad application to lung transplantation, pancreas transplantation, and heart transplantation. After an organ transplantation, the body will nearly always reject the new organ(s) due to differences in human leukocyte antigen between the donor and recipient. As a result, the immune system detects the new tissue as "foreign", and attempts to remove it by attacking it with white blood cells, resulting in the death of the donated tissue, immunosuppressants are given as an attempt to prevent this rejection; the side-effect is that the body becomes more vulnerable to infections and malignancy. B cell deficiency and T cell deficiency are immune impairment that individuals are born with or are acquired, which in turn can lead to immunodeficiency problems  (Nezelof syndrome is an example of an immunodeficiency of T-cells.). ^ a b "Immunodeficiency disorders: MedlinePlus Medical Encyclopedia". medlineplus.gov. Retrieved 2017-05-06. ^ "NCI Dictionary of Cancer Terms". National Cancer Institute. 2011-02-02. Retrieved 2017-05-06. ^ a b "Immunosuppression: Overview, History, Drugs". 2017-01-06. ^ Wiseman, Alexander C. (2016-02-05). "Immunosuppressive Medications". Clinical Journal of the American Society of Nephrology. 11 (2): 332–343. doi:10.2215/CJN.08570814. ISSN 1555-9041. PMC 4741049. PMID 26170177. ^ Shelton, Edward; Laharie, David; Scott, Frank I.; Mamtani, Ronac; Lewis, James D.; Colombel, Jean-Frederic; Ananthakrishnan, Ashwin N. (July 2016). "Cancer Recurrence Following Immune-Suppressive Therapies in Patients With Immune-Mediated Diseases: A Systematic Review and Meta-analysis". Gastroenterology. 151 (1): 97–109.e4. doi:10.1053/j.gastro.2016.03.037. PMC 4925196. PMID 27039969. ^ Ladwig, Gail B.; Ackley, Betty J.; Makic, Mary Beth Flynn (2016-03-15). Mosby's Guide to Nursing Diagnosis - E-Book. Elsevier Health Sciences. p. 28. ISBN 9780323390279. ^ "Joseph E. Murray - Facts". www.nobelprize.org. Retrieved 2017-05-12. ^ "Immunosuppression". National Cancer Institute. 2015-04-29. Retrieved 2017-07-13. ^ Chandrashekara, S. (2012). "The treatment strategies of autoimmune disease may need a different approach from conventional protocol: A review". Indian Journal of Pharmacology. 44 (6): 665–671. doi:10.4103/0253-7613.103235. ISSN 0253-7613. PMC 3523489. PMID 23248391. ^ "Transplant rejection: MedlinePlus Medical Encyclopedia". medlineplus.gov. Retrieved 2017-07-14. ^ "Immunology of Transplant Rejection: Overview, History, Types of Grafts". 2017-03-09. ^ Charles A Janeway, Jr; Travers, Paul; Walport, Mark; Shlomchik, Mark J. (2001). "Responses to alloantigens and transplant rejection". ^ Lallana, Enrico C; Fadul, Camilo E (2011). "Toxicities of Immunosuppressive Treatment of Autoimmune Neurologic Diseases". Current Neuropharmacology. 9 (3): 468–477. doi:10.2174/157015911796557939. ISSN 1570-159X. PMC 3151601. PMID 22379461. ^ "Immunodeficiency (Primary and Secondary). Information". patient.info. Retrieved 2017-07-13. ^ Disorders, National Organization for Rare (2003). NORD Guide to Rare Disorders. Lippincott Williams & Wilkins. p. 408. ISBN 9780781730631. Retrieved 2 June 2017. Boraschi, Diana; Penton-Rol, Giselle (2016-01-25). Immune Rebalancing: The Future of Immunosuppression. Academic Press. ISBN 9780128033364. Retrieved 6 May 2017. Thomson, A. W. (2001). Therapeutic Immunosuppression. Springer Science & Business Media. ISBN 9789401007658. Retrieved 6 May 2017. This page was last edited on 6 April 2019, at 03:50 (UTC).